Thanks to the featured authors and editors: Ernst Doblhofer, Jolene Babyak, Ali Smith, Frank Palmer, Frederick Bodmer, Jiddu Krishnamurti, Douglas Hofstadter & Daniel Dennett, Susan Sontag, Mark E. Smith, Patsy Rodenburg, and Lyall Watson. Most are debutants on Sentence first, though Palmer, Dennett, Sontag and Hofstadter have had cameos before and Lyall Watson appeared in passing in a post about barking animals. I try not to reuse titles, but Sontag’s was in ‘Virtual light in the heart of the sea’, which is one of the few I’m satisfied with. 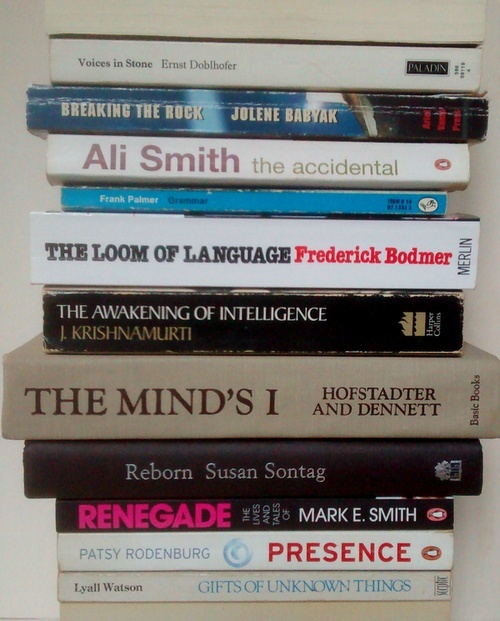 For earlier book spine poems, including links to other people’s, you can browse the archive here. This entry was posted on Friday, July 15th, 2016 at 11:13 am and is filed under books, language, photography, poetry, wordplay. You can follow any responses to this entry through the RSS 2.0 feed. You can leave a response, or trackback from your own site. …in need of more novels. This is the best poem yet! I’m not so happy with it, but thank you! Well done! I wonder if the dadaists ever used this – er – compositional technique. Not that I’m aware of – it strikes me as too organised for them – but there are broad parallels with their ‘cut-up’ method. When I saw the title I thought there was a book called ‘The accidental grammar’ and I wanted to know what it was about. Yes, “The Accidental Grammar” (AN accidental grammar?) is a title that’s longing for a book to make it whole. The title works, I think, whether taken to be commenting on existing grammars or suggesting something novel. Accidence Will Happen is, pleasingly, already the name of a book on usage (by Oliver Kamm), which I mentioned here last year. I first encountered it in the first Asterix book, which was translated into English, I have just found from Kamm’s book, by Kamm’s mother, Anthea Bell. It took many many re-readings and a trip to the dictionary to discover that it wasn’t a typo. Love the mash, most excellent. Thank you. The title of Hofstadter and Dennett’s book is an apt pun given its subject matter. “Gifts of unknown things” is a poem in itself. It is a lovely phrase. The title of Watson’s book about the wind is similarly evocative: Heaven’s Breath.